Frequently Asked Questions | KLH Industries Inc.
How long has KLH Industries been in business? 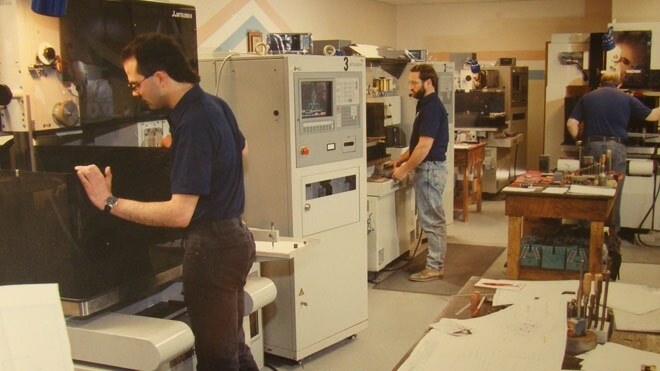 KLH Industries, Inc. has been on the cutting edge of manufacturing since 1987 - over 21 years. While originally only a wire EDM shop (pictured above), continuous and stable growth has allowed KLH to double its square footage four times in the company's history. Custom precision machining services, specifically parts per print. KLH takes pride in being a full-service shop, capable of engineering and manufacturing a one-time prototype into a high volume finished product. Some of our services include EDM: Wire & Sinker; Multi-Axis CNC: Machining, Turning, and Grinding; Micro Hole Drilling; Waterjet Cutting; and Certified Inspection. So, my job won't ever leave your building? Don't you ever use outside vendors? Occasionally, as part of KLH's measured supply chain. KLH only uses accredited vendors who maintain consistent levels of excellence in quality, delivery, and price - the same things our customer's value. What industry markets or sectors do you serve? KLH continues to precision machine for a variety of markets, including Aerospace, Aircraft, Defense, Medical, Electronics, Food Processing, Energy, and Automotive. Can you accommodate rush jobs? Yes, depending upon the part and processes, it may be possible to have same-day or next-day service. Yes. KLH is ISO 9001 certified for precision machining and inspection services, but is also AS9100 certified for aerospace and defense projects that require additional traceability and control. The International Traffic in Arms Regulations (ITAR) is a set of U.S. government regulations to control the export and import of items on the United States Munitions List. KLH strongly recommends that customer identify ITAR-controlled projects at the quoting phase. Visitors to the KLH facility often describe it as "one of the cleanest, most organized shops" they've ever seen. This is, in part, due to embracing Next-Generation Manufacturing (NGM) principles, such as Lean, 6-Sigma, and 5S. Contact KLH to setup a private tour.